It's turkey time again. Thanksgiving in America-- a real Norman Rockwell moment -- but cheer up. Here's a way to brighten the faces around your Thanksgiving table-- The bikini turkey won't keep Uncle Jack from getting drunk, or the twins from fighting with each other, or grandma from forgetting your name-- but it will make you laugh. 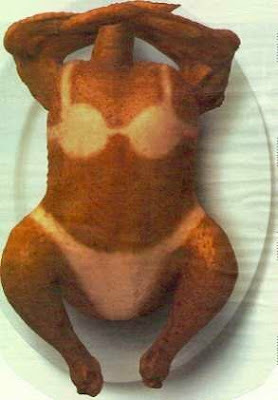 Before you put your turkey in the oven, just create an aluminum foil " bikini" for it, as per the illustration. Secure the foil with basting pins and then stuff roast and baste as usual. Remove the foil before serving ( duh) and give your guests an unforgettable Thanksgiving turkey. This is SOOOOO good! Wish we were cooking the turkey at my house this year! Love it! Next time it's my turn to do the turkey, it'll definitely look like it just came back from the beach. Thanks for the chuckle! Happy Thanksgiving! Glad you guys like it-- isn't it fun? A good talking point for the extended family all sitting around the table eh?